Have you ever been so afraid of stepping out of your comfort zone that you choose not to do it? 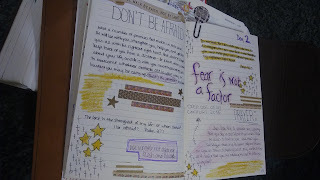 I am here to tell you that fear should not be a factor! While it may seem intimidating and scary, you need to remember that God is on your side! Do not be afraid! Remember, that we wrestle not against flesh and blood but against principalities and spirits! If God is asking you to step out, then step out! You will be missing out on some of the greatest blessings if you choose to allow fear to be a factor! So what is it that God is encouraging you to do? Thank you, I needed that. I feel like the Lord Jesus Christ is encouraging me to drive. I need to step out of my comfort zone, and stop fearing it.